So I bought a set of 308 molds several years ago and they laid around for a couple years since I didn't have the time to mess with them when I bought them. I bought them off ebay with only a few pics to go by. I drove about 11 hours to pic them up and noticed just how chewed up they were. To say they were rough would have been a gross understatement. Words cant begin to describe. But I had paid for them (about $1k I do believe) and I have driven a long way so I loaded them up and headed home. After they sat around for a couple years I finally got the nerve to bold them together and make a body. I used no less than 6lbs of modeling clay just to get the seams, gouges, chips, chunks filled in. Some of the more intricate details were so far gone I had to shape entire sections out of modeling clay. Such as the recesses in the front clip where the fog lights go. One of them had an entire corner missing. 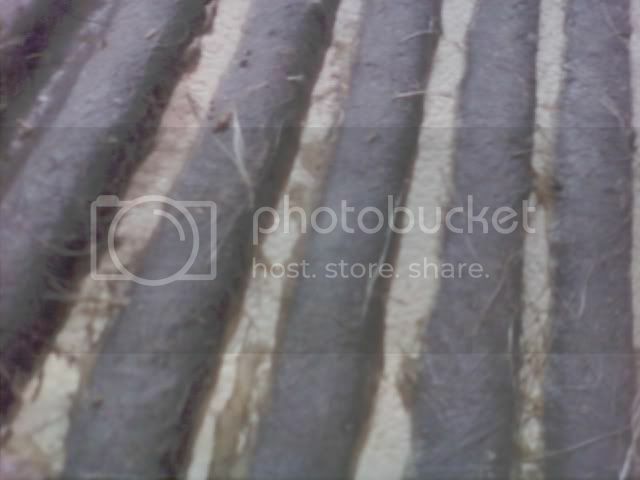 Some of the seams where the mold bolt together were nearly 1/4" inch wide in some places. Some of the shotty-est workmanship imaginable. I finally get all of the parts made after about 3 weeks of laying them up here and there when I had the time and ended up with some body panels that at least still had the over all shape of a 308, though be it a 308 that looked like it spent some time in a war zone. I still had something to work with. Or so it seemed. 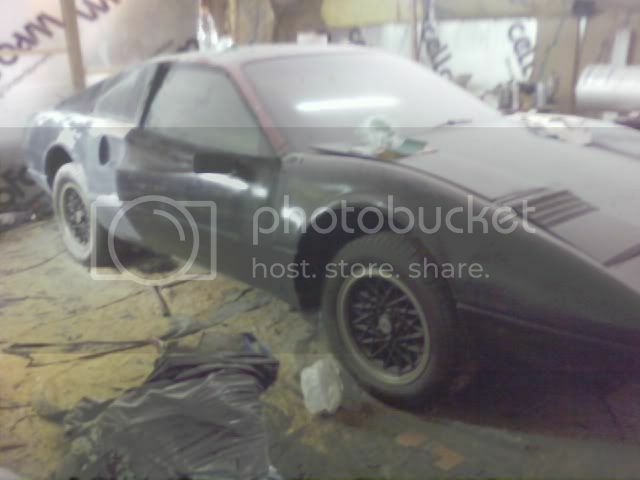 The next step was to remove all the body panels from my 87 GT and start fitting the 308 body. My first problem was the rear clip. 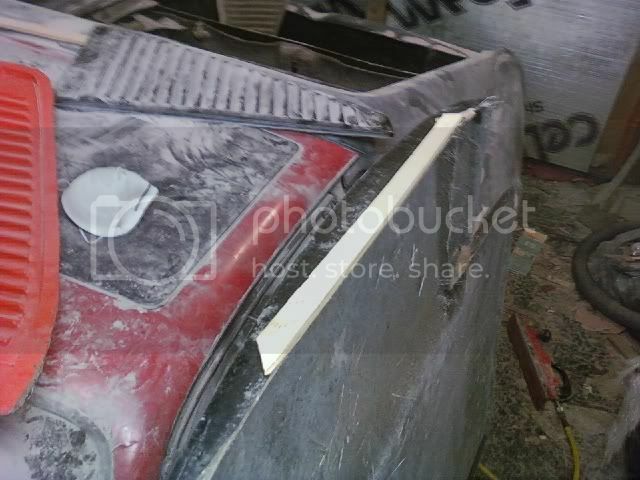 The sides and the rear fascia where two separate molds so the parts had to be glued together. Of course nothing fit right but after a lot of cutting and tweaking I got them glued together to form the rear clip. Once the rear clip was in place I put on the sail panel (fast back panel, whatever you wanna call it) and the fit wasn’t too bad. The flash left behind from where the mold bolted together was terrible. About 3/16” wide and just as tall in most places. An easy fix though. 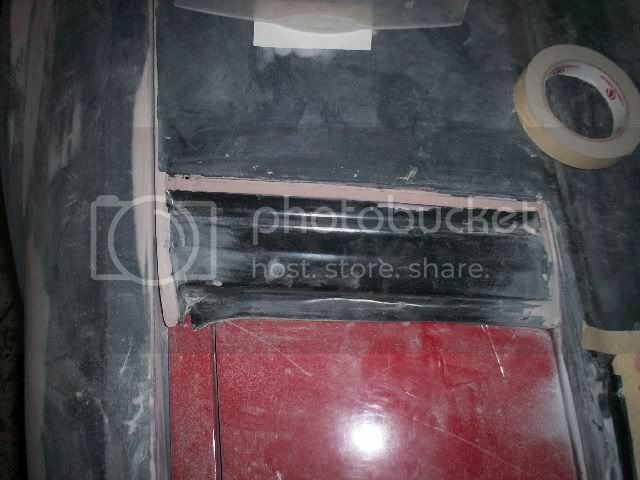 Just needed to build up some more fiberglass on the inside where the seam was and then sand down the flash. 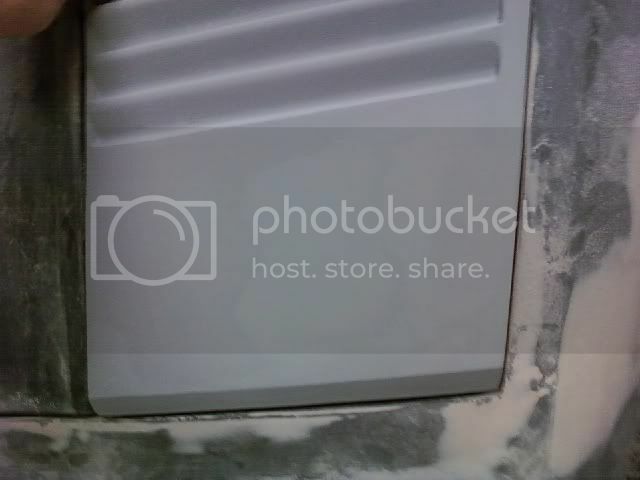 The extra fiberglass behind the seam would ensure I wouldn’t accidentally sand through the part. The top of the sail panel where it meets the roof was messed up a bit. It had quite a sag in the middle of it. I put some pieces of foam rubber underneath it where the sag was and that pushed it back up to where it needed to be and looked pretty good. Next was fitting the doors. I put them both on and it wasn’t too bad but the were some spots where the seam between them and the rear clip was a bit off. A little to far in here, a little too far out there. Next I fitted the front clip and it was after that I felt like just quitting. Where the fenders meet the doors was absolutely atrocious! The seam was terrible and the bottoms of the fenders where they meet the doors were about 1” too far in and to make matters even worse they even flared out toward the wheel well. That whole part of the front clip was completely twisted out of shape. Not to mention all the dips and waves in the front clip. But that was the least of my worries. I decided to tackle the fender problem and began by cutting the wheel well liners and the edge of the fenders where they turn back in and meet the door completely off. Once they were off that whole part of the front clip was really flimsy and could be bent back into shape pretty easily. 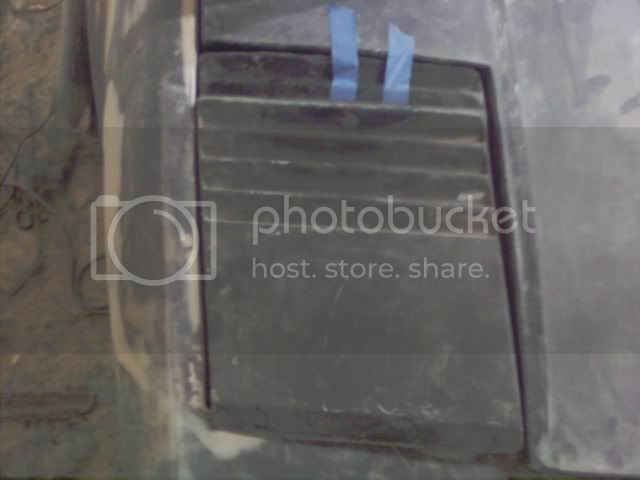 To ensure that the fenders had the same contour as the front of the doors where the two meet I drug out the door molds again and laid up some glass just on the ends of the door molds where they meet the fender. Once they cured and I took them out of the molds I trimmed everything away leaving only the front edge of the door remaining. I then took those pieces and glued them to the insides of the fenders and recessed an inch or so in. Presto! They pulled the fenders into the exact shape as the front of the doors. I didn’t have the front clip fixed but at least I had a good game plan in mind to get it done. After the front clip fiasco I laid on the hood skin. Didn’t fit. Surprise, surprise. 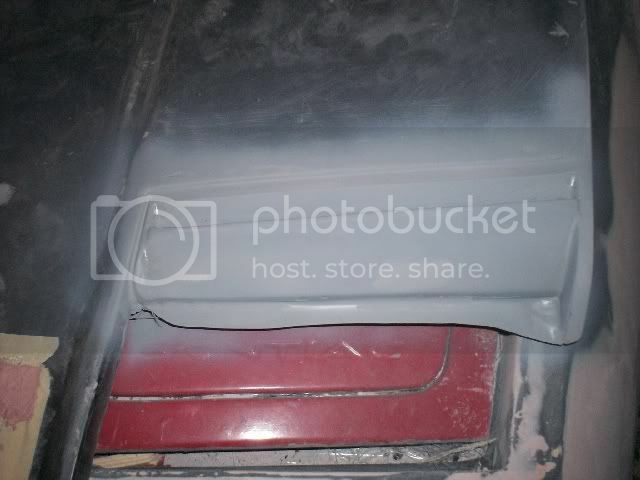 Both side edges of the hood where warped inward so there was no way at all to get them to bend out so that they could fit over the sides of the Fiero hood. The car came with the Mera style headlight covers. The ones that were all louvered. And no, they didn’t fit right at all either. To add to the ill fitting head light covers the very last louver closest to the windshield was a separate piece for what ever reason. Most of the kits I had seen had the last rear lover as part of the hood. I tried fitting the bumpers and they fit ok but where just beat up and really rough looking. The side window louvers didn’t fit at all. They were all warped and about ½” too short in both length and in height… in most places. Not even when it came to parts being the wrong size were they even remotely uniform. Sigh..
Back in December of last year I decided to hit this project hard and get it done. I pulled it into my shop and got to work. Its come a loooooong way in these past two and a half months. I will post pics of what has been done so far and get this build dairy caught up to speed tomorrow night. Stay tuned. More to come. Lots more..
Well, enough of the back story. Time to start getting you up to speed on the progress so far. 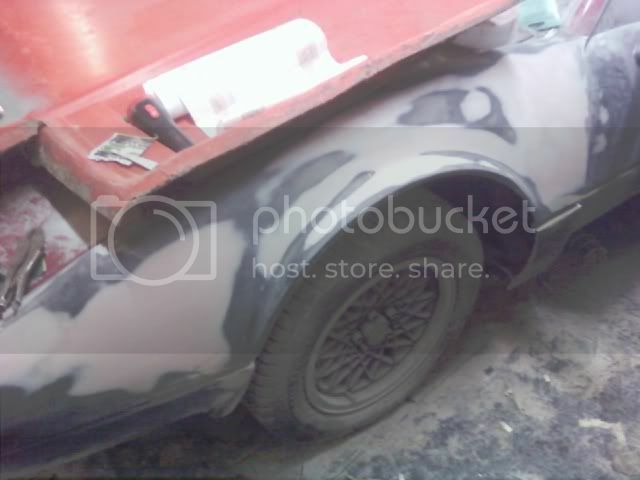 Here is a pic of the car once all the body panels were initially fitted. 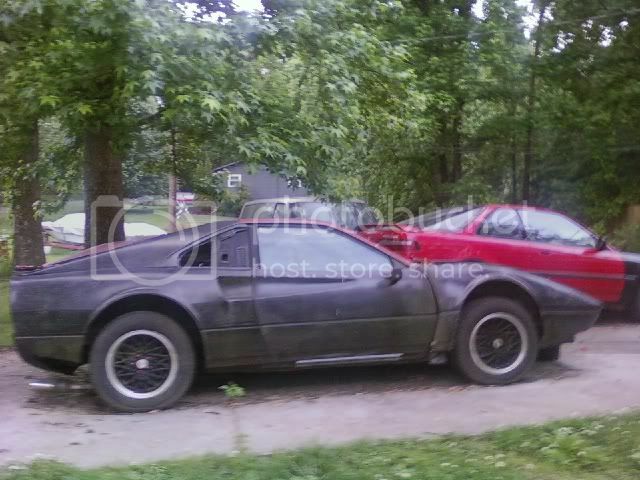 Once I got it into my shop I started on some basic body work. The car was full of waves and dips. At this point I had already gone through 1 and 1/2 gallons of bondo! 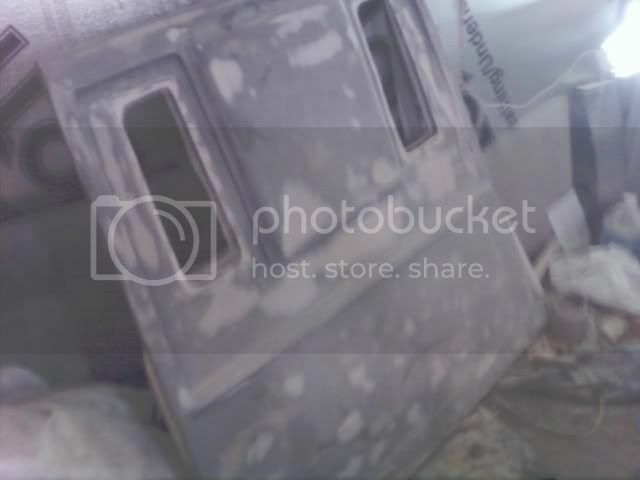 The deck lid looked like the mold was taken off a car that was totaled in a hail storm. 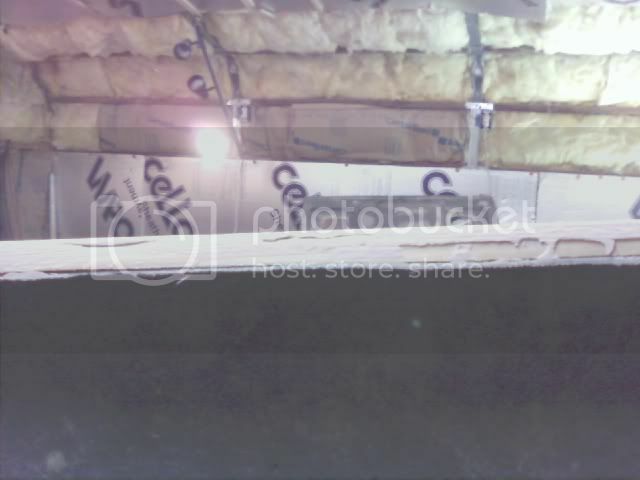 How fiberglass got looking that way is beyond me. I had about 2 dozen little dings to fill in. I didnt like the look of the head light covers being all louvered so I wanted to make them look like a head light cover with louvers behind them to look more like the original car. 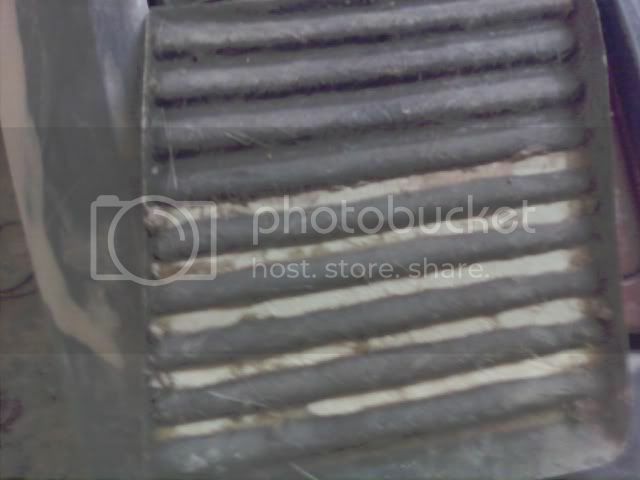 To do this I ground off the tops of the first 5 or so louvers and placed a fiberglass board on to of them and glued it down from the inside and blended in the seams from the outside. In the next pic you can see the progression of parts for the headlight covers. The black part it the original plug I made. The orange is the mold I made of the part and the one in the middle is the part made from the new mold. Now I had something solid to work with to get the finished piece the way I wanted it. Here is how I fixed the problem with the sides of the hood being warped inward. I cut a piece of wood in a long wedge shape about 3/16" on one edge and tapering to nothing on the other. The strip was about an inch wide. I glued the strip to the side of the hood with the thick edge of the wood at the bottom. This brought the bottom edge of the hood outward to about where I needed it to be so it wasn't bent inward anymore. 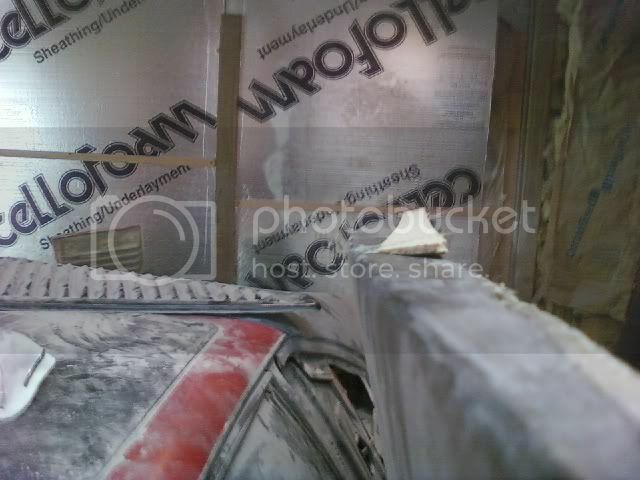 Once it was glued on I put a ton of bondo in the middle between the top of the hood and the bottom edge. Then I took my bondo spreader and ran it the length of the hood. I did this several times to get the desired effect. You can see in the last pic that the bottom edge of the hood ended up being built up almost 1/2 and inch by the time it was all said and done. I wanted it to flair outward just a hair as apposed to being a square 90 degree angle. 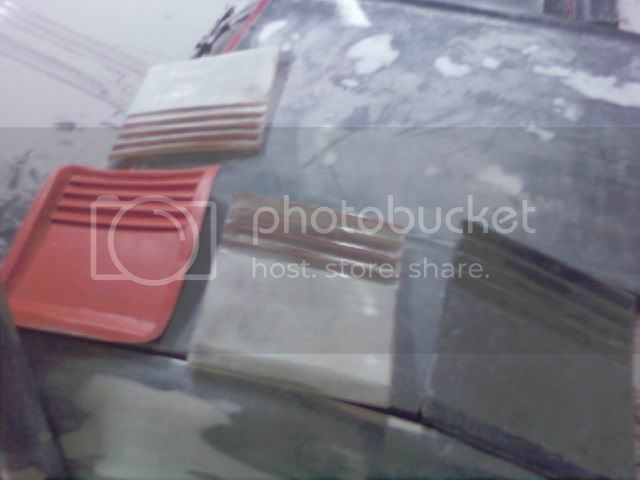 I figured this would make it a bit easier to fit the fished hood skin to the Fiero hood later on since it would be easy to get the sides of the hood skin to fit over the sides of the Fiero hood. 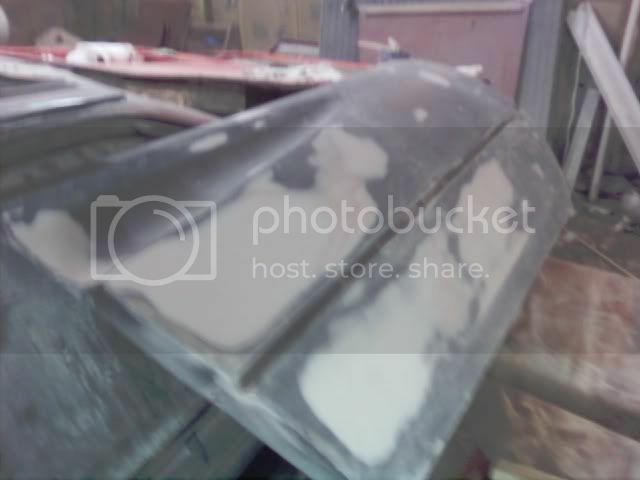 As with all of the parts I am having to fix/fabricate with huge amounts of bondo the hood will be used as a plug to make a new mold and then use this new, bondo free part on the car. Good to see you back at the kit hobby again after a few years. Keep the updates coming. I have worked a deal with a local fellow that wants a front clip setup like the one I am doing so i am going to pull some moulds of the top of the fenders and front trunk and headlights to let him do the same thing to his 308 kit. Thought it would be silly to go though all this effort to get everything just right and not make molds. Excellent molds off an excellent body to be able to produce a body that 90% ready to prime and paint right out of the molds! 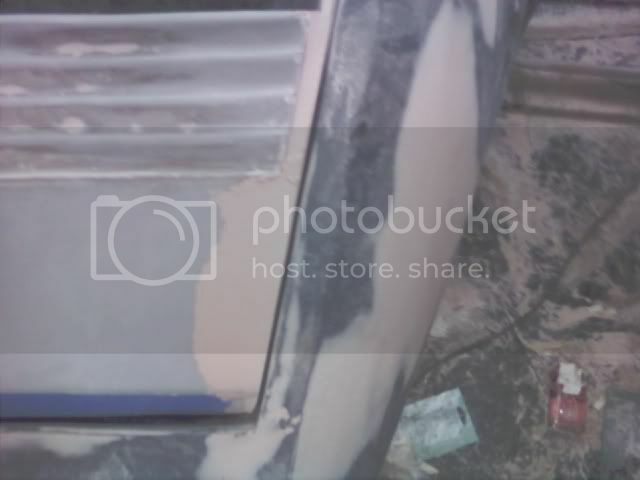 It shouldn't take more than a tea cup full of bondo to finish all the body work. Most of that will just be touching up the mold flash lines. I already have molds to produce all of the lights now (rear lights, side markers, front signals). All of which were made from original Carello lights. I'm even making a custom rear housing for the front signals so they will plug right up to the OEM Fiero light bulbs. Thats what I already did for the rear lights and markers. They all have Fiero sockets so the stock bulbs plug right in. Next on the agenda was to attach the last rear louver piece to the hood (as it should have been to begin with in my opinion). This was pretty strait forward. I just lined them up and glued them in then. I had to do a bit of trimming to get them to fit halfway decent. 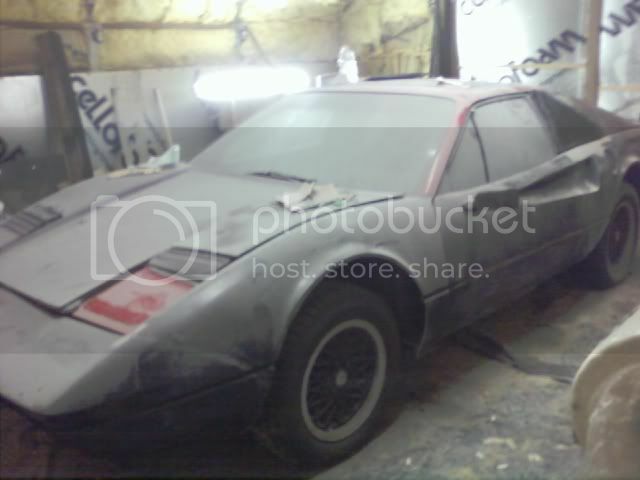 Once they were in it was just a matter of some creative bondo work. I made some false seams around them where they meet the hood so it will appear like they are separate pieces though they will actually be part of the hood. The trail fitting was pretty bad. The head light covers didn't fit right and the rear louver piece was a mess. Just had my first major set back today. I bought a set of 308 front turn signal lenses to make molds off of and both lenses ended up sticking in the molds!. One lens broke trying to remove it and both molds are shot. I cant figure out why this happened. I used the same process as I always do but for whatever reason it all went awry this time. So now I'm out $160 for the lenses and $80 for the mold materials. sigh..
Back to the build.. My next major task was to get the head light covers to fit properly. As you can see from the following pic they were about 3/8" too narrow and the front did not line up correctly with the front of the car. The angles were different. 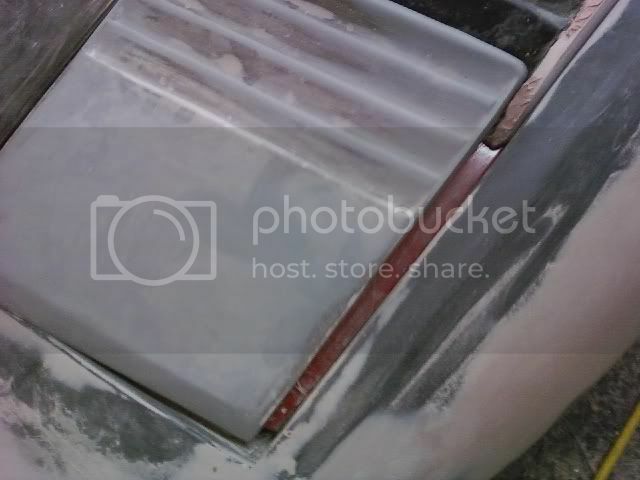 I started building up the sides and the front with bondo (an obscene amount of bondo) and sanding to get the right width and the correct angle on the front. After a ton of bondo and sanding I finally got them fitting nicely.